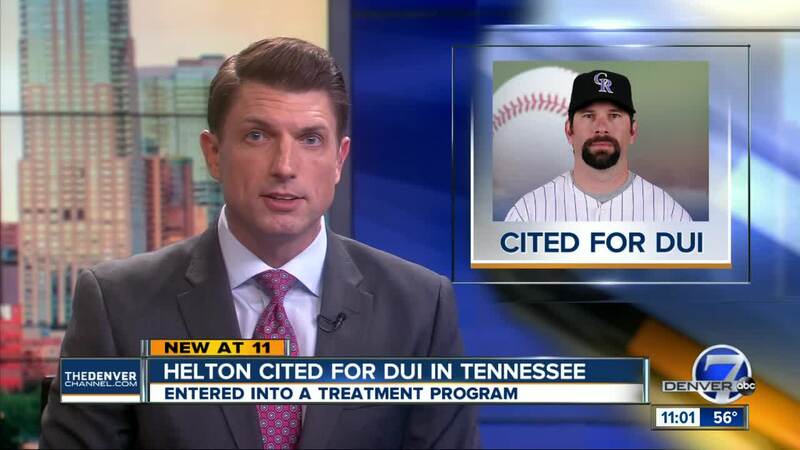 DENVER – Former Colorado Rockies first baseman Todd Helton has entered a treatment program after he was cited earlier this month for driving under the influence in Tennessee, his attorney says. Helton, 45, was cited by the Knox County (Tenn.) Sheriff’s Office for DUI on March 18. According to an accident report obtained by Denver7, officers responded to a single-vehicle accident southwest of Knoxville just before 6 p.m.
Helton’s truck had left the road and hit a telephone pole. Emergency responders were already tending to Helton once police arrived, according to the report. The report says that officers couldn’t conduct a field sobriety test or interview him because he was transported to a nearby hospital. The report says Helton was issued a misdemeanor citation for DUI since he had to be taken to the hospital. Helton did voluntarily provide a blood sample while at the hospital, the report says. “The Helton family is thankful for the officers and medical professionals who took great care of him. Because of those first responders, he was not seriously injured,” Helton’s attorney, Stephen Ross Johnson, said in a statement Monday. Johnson said Helton was in a residential treatment program. “He realizes there are parts of behavior that need to change, and he is focused on doing just that. While there has not been a final court decision about his citation, Todd is still taking action,” Johnson said, adding that Helton takes his role as a father and role model seriously. “Mr. Helton is grateful for the support of his family and community and asks for their prayers,” Johnson said. This month's citation wasn't Helton's first brush with a DUI charge. Helton pleaded guilty in May 2013 to driving while ability impaired in Thornton, Colo. He received 12 months of probation and 24 hours of community service upon sentencing. He was originally charged with DUI, which was amended to DWAI, as well as driving under the influence per se and careless driving – which were both dismissed, according to court records. Helton was born in Knoxville and attended high school there before going on to the University of Tennessee. He played his entire 17-year career with the Rockies and holds many of the club’s offensive records.